William Paterson University, officially The William Paterson University of New Jersey, is an American public university located in Wayne, New Jersey, United States. Founded in 1855, William Paterson is the second oldest of the nine state colleges and universities in New Jersey. William Paterson offers undergraduate, graduate and doctoral degrees through its five academic colleges. During the Fall 2013 semester, 10,027 undergraduate students and 1,387 graduate students were enrolled. 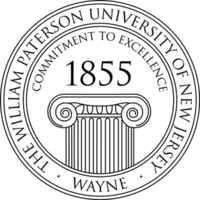 William Paterson University was founded in 1855 as the Paterson City Normal School. For more than a century, training teachers for New Jersey schools was its exclusive mission. In 1951, the University moved to the present campus. Originally known as Ailsa Farms, the site was purchased by the State of New Jersey in 1948 from the family of Garret Hobart, twenty-fourth vice president of the United States. The University changed its name to Paterson State Teachers College when it relocated from Paterson in 1951. In 1966, the curriculum was expanded to include degree offerings other than those leading to a teaching career. In 1971, it was renamed The William Paterson College of New Jersey. The change of name honored William Paterson, who was the state’s first senator, its second governor, and a United States Supreme Court Justice appointed by President George Washington, and reflected both the institution’s beginnings in the city that also bears his name and the legislative mandate to move from a teachers' college to a broad-based liberal arts institution. The Commission on Higher Education in June 1997 granted William Paterson university status.